Enjoy a relaxed five star Christmas dinner for two or double up for extra guests. 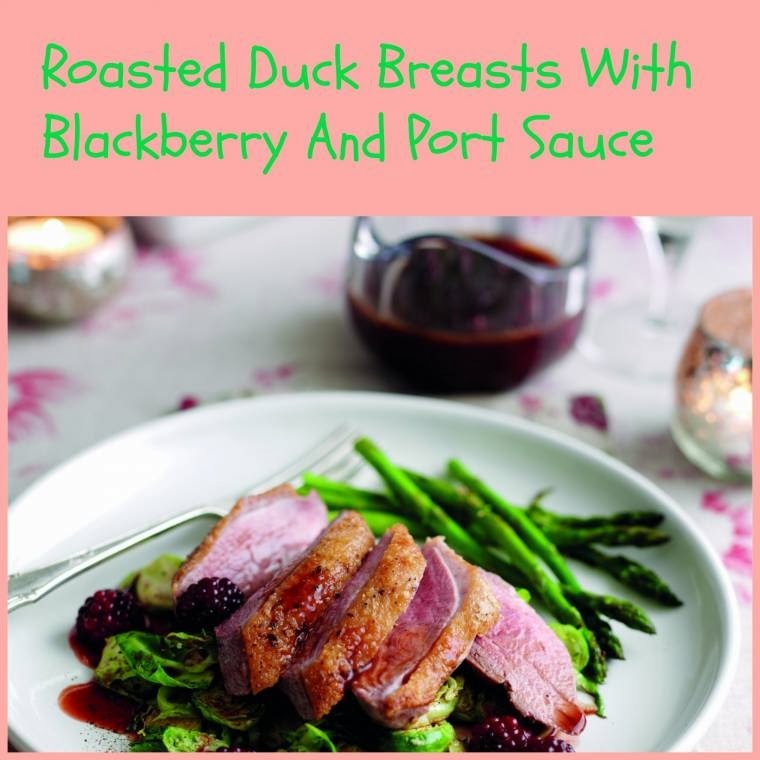 Prepare the blackberry and port sauce and pack the sliced sprouts into a plastic bag earlier in the day, then roast the duck breasts while the potatoes dauphinoise bake, for an easy Christmas dinner. Heat the oil in a saucepan, add the onion and carrot and fry over a medium heat for about 10 minutes, stirring from time to time until the vegetables are a deep golden brown. Take the pan off the heat and add the garlic, herbs and nutmeg then the vinegar and port. Return the pan to the heat and cook for 2 minutes until most of the liquid has evaporated then add the stock and salt and pepper and cook over medium heat for about 5 minutes or until reduced by about one third. Strain and reserve. Preheat the oven to 220oC (425oF) Gas Mark 7. Slash the skin of each duck breast, 4 or 5 times then rub in a little salt and pepper. Add the breasts skin side downward to a cold frying pan and cook over a low heat for 6 minutes until the skin is just turning golden. Turn them over and cook for 1 minute. Lift the duck out of the pan and transfer to a rack in a small roasting tin, skin side uppermost. Roast for 10 minutes for rare, 15 minutes for medium or 18 minutes for well done. Meanwhile, pour off most of the duck fat from the frying pan to leave about 1 tablespoon, add the sprouts and stir fry over a medium heat for 8-10 minutes until softened and golden brown around the edges. Add the garlic, nutmeg and a little salt and pepper and cook for 1 minute. Cover and keep hot. Allow the duck breast to rest for 3-5 minutes. Add the blackberries to the sauce and warm through. If you prefer a thicker sauce, add the cornflour and bring the sauce to the boil, stirring. 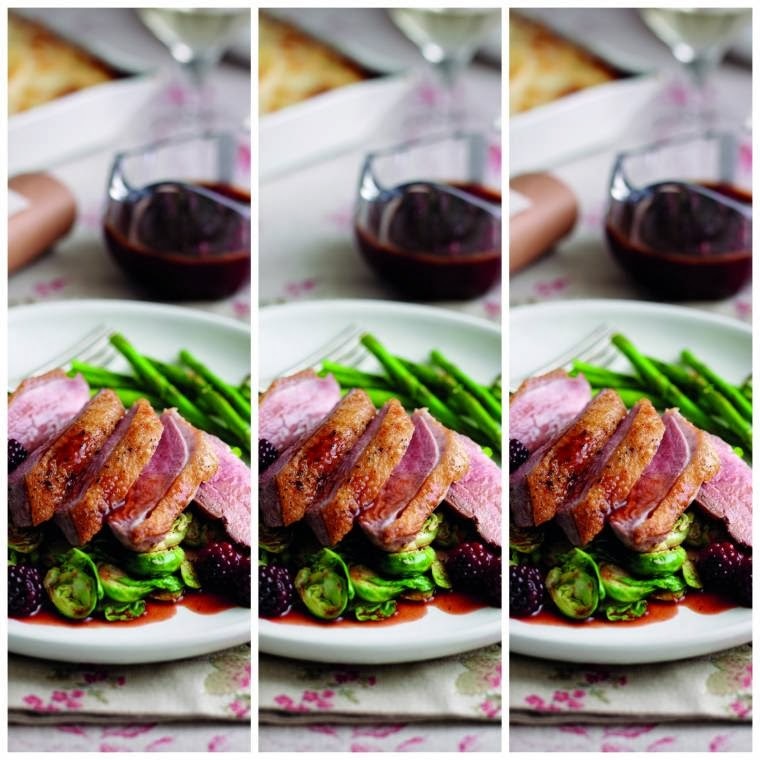 Carve each duck breast into 4 or 5 slices. Arrange the sprouts on serving plates, top with the duck and spoon over a little sauce, serving the remainder in a small jug. Accompany with steamed asparagus and baked potatoes dauphinoise. "2/12 Creative Mondays Blog Hop And This Weeks Features." Looks yummy and definitely delicious for Christmas dinner Claire!